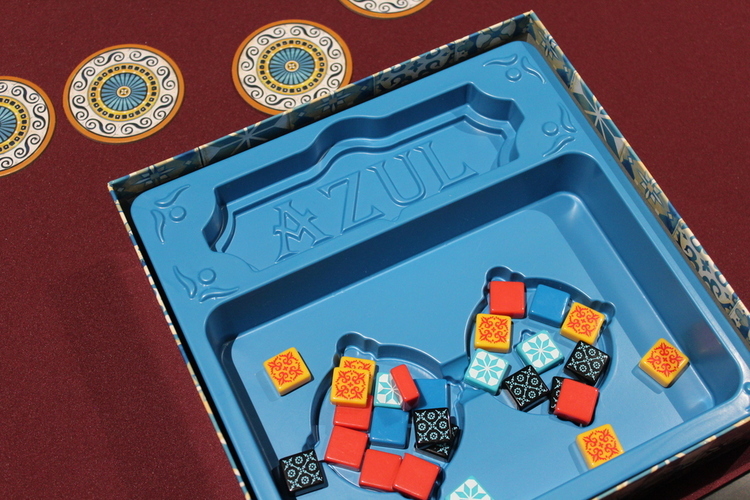 After the success of Century: Spice Road, we have all been holding our breath for the next release from Plan B Games and they certainly haven’t failed us with the deceptive little beauty that is Azul. Azulejos are the blue and white tiles embraced by the Portuguese when their King visited the Alhambra of Southern Spain and fell in love with them. As a tile-laying artist you have been tasked with decorating the Royal Palace of Evora. Give each player a board (coloured wall up for the first game, we’ll talk about the variant at the end!) and a score marker which will start on zero. Put the appropriate number of factory displays out (5 for 2 player, 7 for 3 player and all 9 for 4 players), place them in a circle with some room in the middle. Randomly draw tiles from the bag, placing four on each display and the start player marker in the middle. Taking turns, players take either all tiles of one colour from a factory display, pushing any left over tiles into the centre or take all tiles of one colour from the centre. If you are the first player to take tiles from the centre this round, you must also take the start player token and place it in the leftmost free space in the ‘Floor Line’ at the bottom of your board. 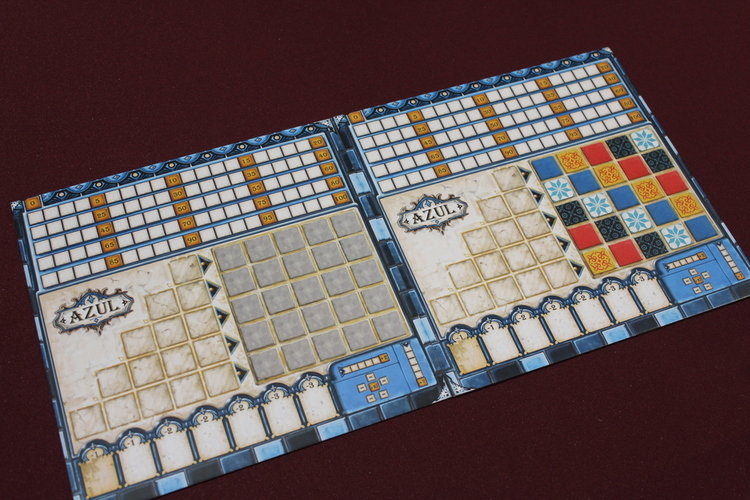 Then, add the tiles you took onto one of the five pattern lines of your board. Place the tiles one by one, from right to left onto the pattern line. If the line already has tiles you may only place the same colour tiles in it. Once all spaces in a row are filled, it is considered complete and any tiles you have picked up that you cannot place must go on the floor line. Obviously as the game progresses there will be tiles you cannot place as they have already been filled, if you are forced to take these, they will also end up in your floor line, resulting in more negative points. Your goal in this phase is to complete as many pattern lines as possible, because during the next phase you will only be able to move tiles from complete lines onto your wall. This phase ends when there are no more tiles available to take from both the factory displays and the middle of them. If no one has completed a horizontal row of tiles on their wall, move onto the next round. Begin by re-filling the factory displays with four tiles each. If you run out of tiles in the bag, refill it with the tiles that were previously set aside in the box. Place the start player token back in the middle and start the new round. 10 bonus points for each colour of which you have managed to place all five tiles. The player with the most points is the winner! In case of a tie, the player with the most completed rows is declared the winner. 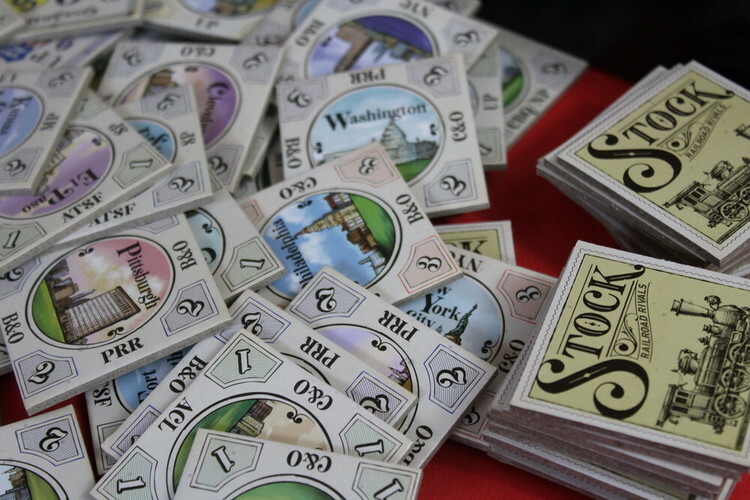 The plain side of the player board can be used for an advanced version of the game. Players can choose to place tiles anywhere during the wall-tiling phase, however, the same colour tile cannot appear more than once in each vertical line. 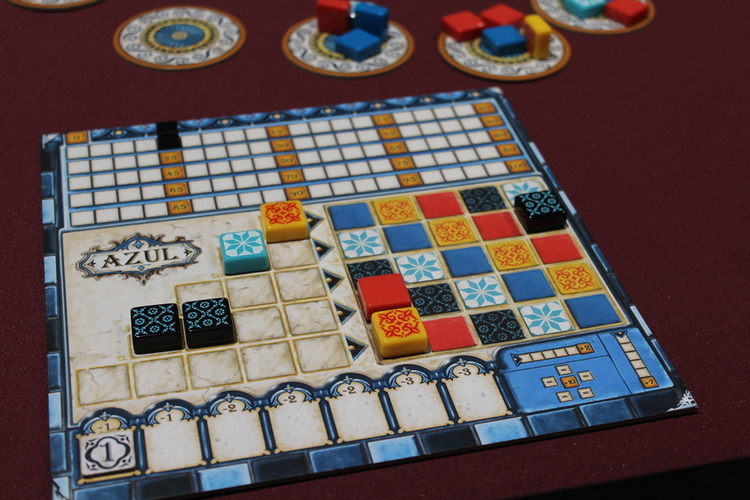 Azul is a really elegant game, simple, easy to pick up rules yet with a surprising amount of depth. There are points in the game that you really need to sit and think about what tiles you take, lest you be stuck taking a huge number of tiles you can’t place and ending up with the negative points. There’s real strategy in this colourful looking game. 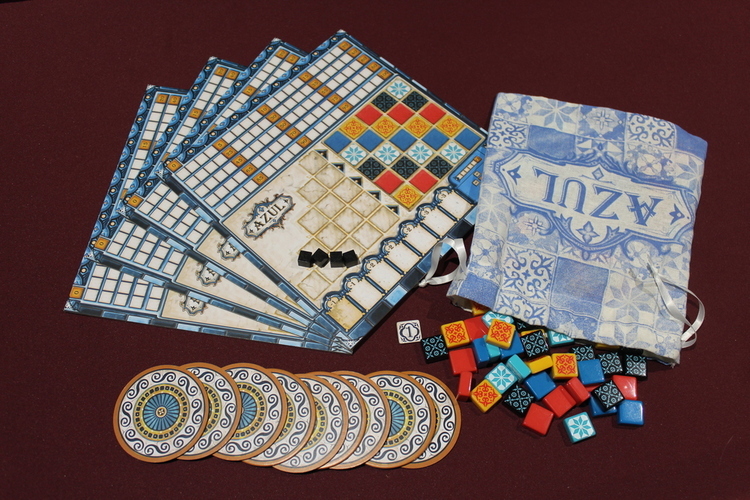 As with Century: Spice Road, the components and insert are lovely for this, the printed bag adds a real touch to it. While details like this aren’t necessary, they prove thought has gone into this game and that really shines through both in the components and the game play. My only criticism is the little cardboard start player token, we spent ages looking for a tile and realised we had nearly thrown it away on one of the ‘empty’ punch boards. It would have been nice if this was a tile in a similar style to the others. This has been our most played game of our Essen purchases and everyone, regardless of skill level, has enjoyed it. Review copy kindly provided by Plan B Games, please note this is the German edition so components may vary slightly with the English edition.